Watch Alexander Nevsky and you can't stop noticing the fact that this is both a film and propaganda. Produced in 1938, it was swiftly removed from Soviet film theatres later that year when the Nazi-Soviet pact was signed. It returned to them in 1941 following the German invasion of Russia. 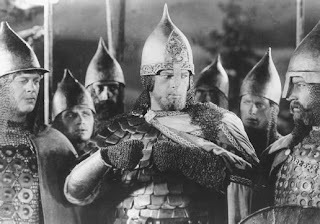 The film concentrates on the story of Alexander Nevsky, a historical Prince of Vladimir, who fought the Teutonic Knights in the 1240s. The film deals with this subject by bringing together several battles into one great confrontation: on the one side is Nevsky, on the other the Knights. The first hour of the film constructs the confrontation between Nevsky and the Knights, the second half of the film reveals the battle between the two forces and the outcome of that battle- whose implications are quite clearly meant to reverbrate down the centuries to the atmosphere of 1941. This film attempts to make statements about the way that history works and the ways in which it intersects with class, nationality and religion: the way that events are shaped by those forces and by the force of the charisma of a single individual. Writing a review of propaganda is not easy. This film is nationalistic, anti-religious, possibly anti-semitic, definitely prejudiced against the wealthy and jingoistic. It is a Stalinist production and relates to that period within the history of the Soviet Union when Communism became a nationalistic creed. One can admire the artistry. There are shots of genius in this film. There are shots of amazing beauty which still stun the eye today. Some of the photography across the icefields of Northern Russia is sublime. A shot of skulls in the snow after a great battle is stark but sums up in one image the desolation of death. All the way through the film you can see the way that it has influenced modern cinema. It is impossible to film snow or ice without thinking about Nevsky. It is impossible to film a battle sequence without (consciously or unconsciously) referring to the great battle with which this film culminates. Eisenstein made propaganda but he encased the Stalinist offal in chocolate: the film should come with a warning- dwell on the edge and taste the sweetness, bite too far in and rotten juices from the meat flow into your mouth. The ideas of the film- the offal- is interesting because of what they tell us about Soviet communism. THe key moment in the film rhetorically is when Nevsky summons the Peasants from around Novgorod to defend Russia. When they arrive, they and the poor townsmen help defend Russia with an innate sense of Russianness and a wisdom based on proverbs about hares and foxed. Nevsky himself seems to operate best in this milieu. For Communism, an industrialising creed, this might seem strange but it testifies to the ways in which, as Orlando Figes and others have described, the Communist regime became nationalistic. Consequently although Catholicism is condemned and one of the 'traitors' is made to look Jewish, orthodoxy is not questioned. The film supports a project which says that at its core Russia is Russian and truth springs from the people of Russia, in particular the peasants of Russia. This reading of the film suggests that it is Stalinist but also that Stalinism can be seen as changing through the medium of its own propaganda. It is difficult to review a film which does mask such dark ideas. I have not done Nevsky justice in these reflections nor have I found a real theme to hang this review upon. I think though it is a film worth seeing- mainly for its artistry and imagery. Its ideas are interesting but I found them too linked with the totalitarian regime that inspired the film to be satisfying. Ultimately they are the beast, the cinematography is the beauty.